Upon research, I realized that crushing up ‘crepes dentelles’ (another name for these is the brand-name called ‘Gavottes’) is a great substitute, or if not the same as the ‘paillets feuilletine’ itself. You won’t believe how happy this realization made me! Because it means that I could make them at home whenever needed, moreover, it’ll be fresher & crunchier! (And quite probably superior than store-bought because it won’t have any substances you won’t normally include in a home-baking situation). 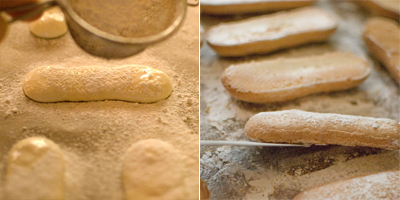 Def: Crepes dentelle is a wonderfully delicate & flaky cookie that is often folded in to a cigar shape. 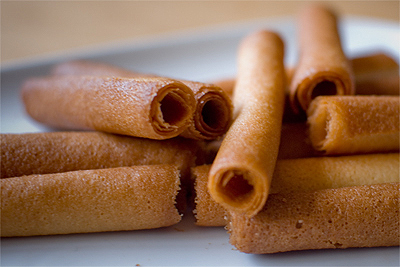 Buttery in flavour, it is made from thin crispy crêpe that is rolled as soon as it is out of the oven. It originates from Quimper, a charming little town with an almost village-like atmosphere, in the cultural heart of Brittany, France. Crepes dentelles are a delight to eat on it’s own or pairing it with cream-based desserts. Def: Paillets Feuilletine is a baking ingredient that is often used as a component in French desserts for it’s crunchy texture. It is used for Praline Feuillete for example, where feuilletines are stirred in to chocolate & praline paste (… think posh version of ‘chocolate cornflake cake’). 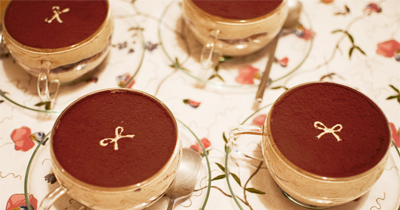 Pâtissiers will then spread this thinly in a layered cake to add crunch to a moussey cake. Chocolatiers might enrobe feuilletines mixed ganache to make crunchy bonbons. 1. Preheat the oven to 210 degrees. 2. 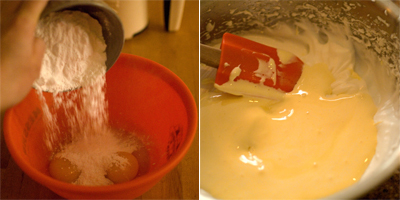 Melt 60g of butter completely in a mixing bowl. 3. 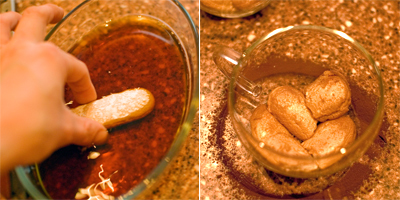 Put 110g of sugar in the hot melted butter. 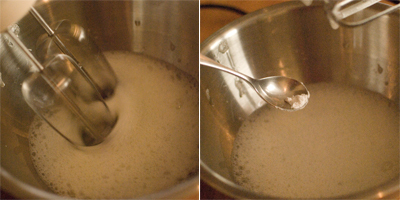 Stir until the sugar has dissolved & is not grainy. 4. 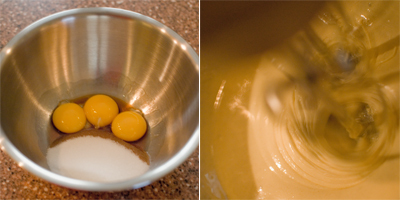 Whisk in 1 egg white. 5. Sift in 60g of flour. 6. 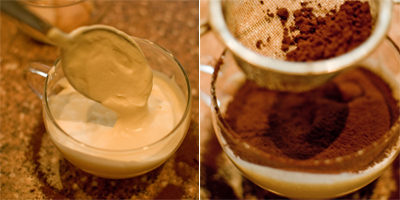 Use a whisk to mix in to paste. 7. Pour in half of the water & mix well. 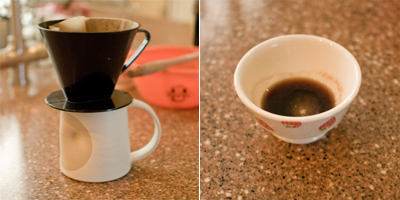 Then pour in the rest gradually to the correct consistency. 8. Spatula all of the batter in to a piping bag. 9. 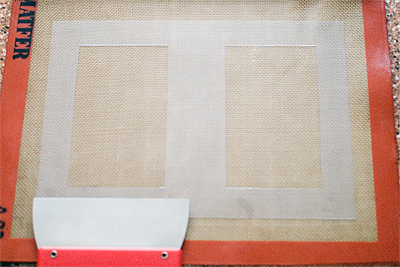 Lay the stencil template on the silpat. Hold down to keep it flat & in place. Spread on the batter evenly with the spatula. A: Domestic ovens tends to brown goods unevenly. For example, my oven browns faster from the edges, which makes it difficult to evenly brown my sheet of Crepes Dentelles. So, for ‘even’ browning, the placements of the batter on the silpat has to be considered. The middle of the tray (away from the edges) is best. B: Also, please resist the urge to spread too many shapes on one tray. 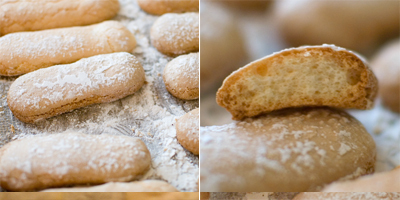 When the time comes to rolling them in to Crepes Dentelle shapes, there is only about 15 seconds to do so before it’s too rigid. About two spreads per tray would be ideal I think. 10. Place the silpat on the baking tray. 11. Insert this in to the middle-shelf of the pre-heated oven & bake. 12. In the meantime, while you wait for it to be baked, spread the next batch on another silpat. You can pop it in when the first comes out. 13. 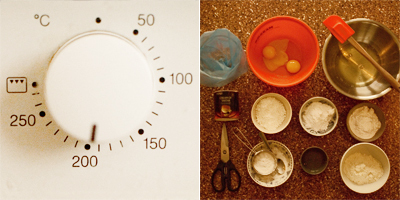 The baking could take anything between 2 to 4 minutes. Best to check wether it is done from 2 minutes onwards. You might also want to turn your baking tray around to brown it evenly. 14. 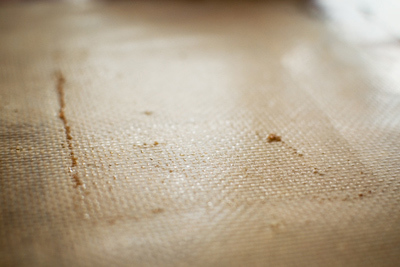 If making Paillets Feuilletine, take the baked sheets off the silpat to cool, then crush with your fingers. If making Crepes Dentelles, immediate start rolling it in to shape. – To roll in to round cigar spirals, use a straw or any thin cylindrical rod. 15. 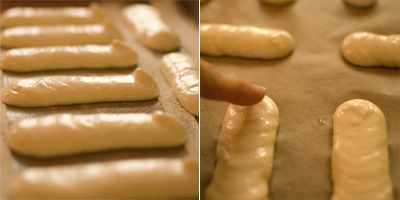 Continue baking by swapping turns between the two silpats. Just remember to clean off any excess bits on the silpat by wiping with kitchen paper or by scraping with a different spatula. 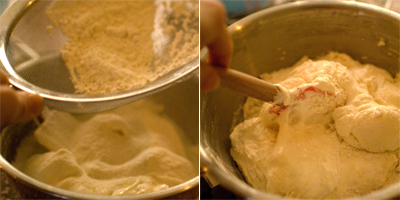 – Cutting to size: I like to cut mine with lots of ample frame all around so that the batter does not land on the silpat. It keeps the silpat clean & crumb-free for the next batch. The measurement of the rectangle is up to you. FYI, mine is 9cm x 16cm. Backtracking humongously here, but here are some pictures from before Easter. There are seven Japanese mums at my son’s school, & we all got together to raise funds for the Japan earthquake & tsunami relief. 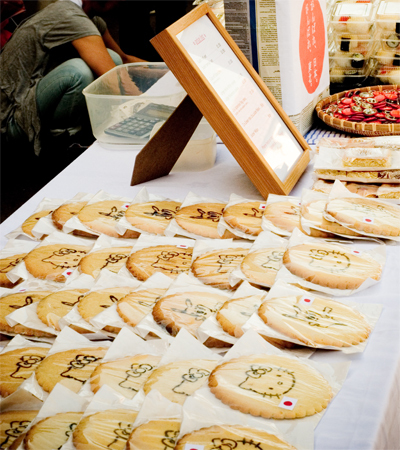 We did a sushi & cake sale in the school yard, & I of-course contributed by baking cookies & cakes. ~ I knew I wanted a Japanese theme to them. ~ It had to appeal to primary school children & their mums. ~ It also must be time & cost effective for maximum return. (The going-rate for cake spendage is 20p to a £1 at a standard school cake sale, so for the pricing to be set so low, the cost of ingredients must stay minimal…) ~ And most importantly, explicitly with NO nuts as the school has a nut-free policy. After a quick sesh with my thinking cap on, I figured the best way is to bake cookies but also add value to them by imprinting famous childrens characters. Hello Kitty to appeal to girls, & Pikachu (Pokémon) for boys. 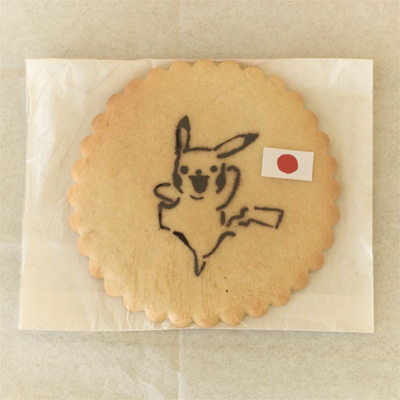 As for the cookie recipe, I used the tried & tested Nontan one that I wrote about previously on this blog. 1. I found a line drawing that I like on the web. 2. Then printed it out b&w to a size that I want. 3. Layer a clear acetate sheet on top of print, secure the corners with sellotape. 5. Place acetate on cutting board, & carefully cut out the black lines. – The important thing to remember when cutting a stencil is that if there is a ‘perfect’ continual line, you have to break it to avoid cutting out the inside. It’s a bit difficult to explain, but think of the inner circle in letter ‘O’ for example. 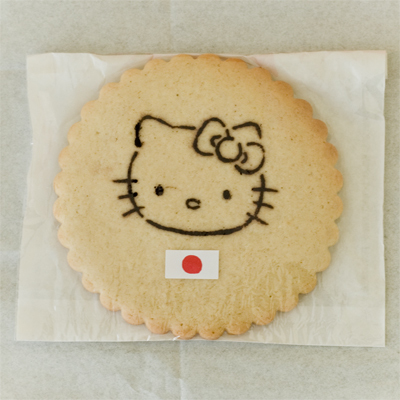 – And if you look at the bow on the kitty cookie below, you’d see that there I left gaps in the line to hold the inside. 6. When you have finished making the stencil, place it on cut-out cookie dough & dust cocoa powder gently & most importantly faintly to avoid smudges. 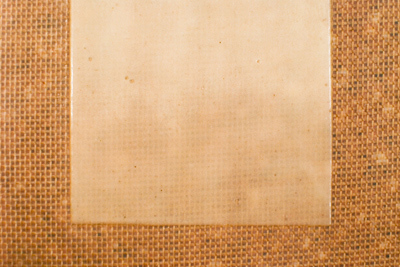 Carefully remove the stencil sheet off, then bake as per usual. Macarons. Macarons. The Heavenly Macarons. 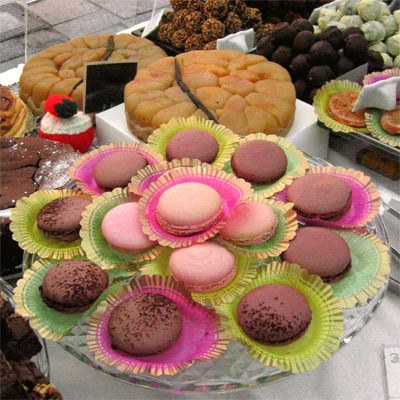 I sell pink Macarons (with raspberry jam + ganache centre) & chocolate Macarons (with dark ganache centre) at my stall. I would love to sell many different coloured ones, as one of the attractions of these morsels is the array of colours it could come in, irresistably displayed like cute buttons. But work-time-wise, I am at my limit. I already make more than ten types of cakes every week, & chocolate truffles, etc, on top of that… Pink & chocolate colours are by far the most popular at the market it seems, so I’ll stick to those colours for now! So without further ado, here is the recipe(s) for Macarons. I’d be explaining the base recipe which you’d use to create any colour Macaron you’d like. And then I’ll also list the ingredients list for Chocolate Macarons, which requires you to swap some of your almond powder with cocoa powder. 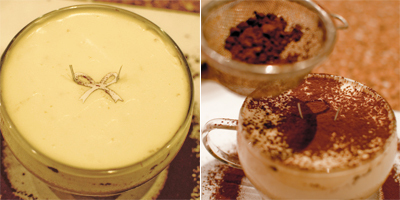 … … This dessert is very difficult to master. A perfect Macaron MUST have ‘THE FOOT’ which is the raggedness around the edges. It mustn’t come out cracked. It must be round. Each Macaron must be of same size. … … So I’m afraid it’s all about trials & tribulations! I’m yet to meet anyone who’d made it perfectly from their first go. It took me numerous attempts with recipes from many sources to get it looking alright enough for me to sell. To have to try again & again til perfection is a test of endurance for your love of Macarons. Just remember, every single step in the recipe is important, otherwise, sorry to say, you’re doomed for failure. … … Also, please remember that everyone’s oven is different. Is it fan or convection, is it pretty old & not precise with temperature, does it have heat spots… (I have a heat spot on the right for example). Every oven has it’s own knack. So I recommend the use of an oven thermometer! This little biscuit requires preciseness. a. Sift almond powder & the icing sugar TWICE. It’s your chance to get rid of the not-so-fine almond powders. b. 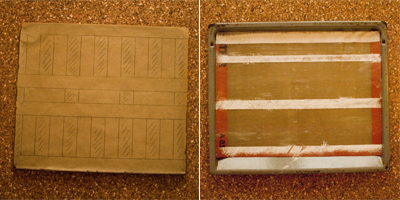 Line baking tray with cut-to-size baking paper (or prefably a silpat if you’ve got one). Place this tray on top of another tray (Doubling up the tray delays the heat cooking the Macaron from the bottom. This insures that the outer surface is dried up first before the inside starts to lift it up. This is what makes that all important ‘foot’ & the smooth surface that is not cracked). c. Have a piping bag ready. 1. 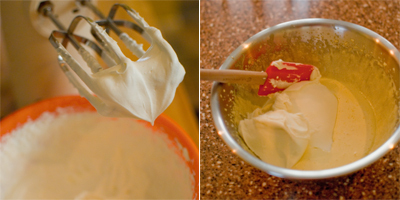 Whisk the egg whites with the icing sugar. Whisk until stiff peaks. 2. (Optional) Add food colouring (Literally droplet at a time, as these droplets paint the whites unapetizingly vivid if you’re too generous. But also remember that the colour intensity will be slightly less once you incorporate the dry ingredints later!). Mix it in to the whites. 3. 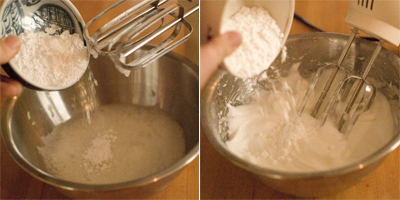 Deposit the pre-sifted dry ingredients (almond powder & icing sugar) in to the white in one go. 6. (skip this if you’re using silpat) Scrape the left over mixture from the now empty mixing bowl & smear it under all four corners of the baking paper. It’ll act as a glue to stick the paper to the tray. 7. Pipe 3-4cm rounds on to the baking paper. Make sure to leave atleast 2cm around it as it will spread later. 9. Leave it aside for 20-30 minutes. This is to dry the surface of your macarons. After the time is up, check how dry it is by gently touching the surface. Does the dough stick back? Leave it aside for another 10 minutes. Once it’s not sticky, proceed to the next step. 10. Prepare your oven shelves – you’d want to place your trays on middle shelf. I’d like to cover the shelf above it with foil so that there’s no direct heat hitting my Macarons & discolouring it brown. 11. Pre-heat oven to 190 degrees. 12. Pop your trays in. (Make sure they are doubled up!!) Sit by your oven with your oven gloves. 13. Once ‘the foot’ graciously appears (it’s usually after 4 – 5 minutes), & has reached it’s maximum height, open the oven & quickly but safely take the bottom tray away (meaning don’t double it up anymore). Place the macarons tray back in the oven. 14. Change the temperature dial to 170 degrees. 15. Bake it for another 5 – 7 minutes. If the colour of the surface is starting to brown, turn the oven off, keep the door shut, & bake it with the remaining confined temperature. 16. Leave aside to cool together with the hot baking tray. 17. Once cooled, you’d have to remove it off the baking paper. 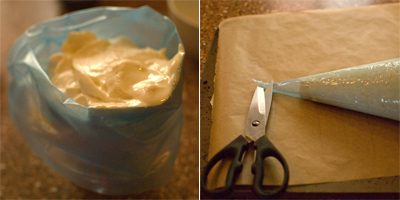 To do this, you dab water on the baking paper under each Macaron & wait a few seconds. The paper should peel off easily without giving. Just do this process slowly & patiently – these Macarons are delicate stuff (if you’re using silpat, just use a knife & slide them off). Now, you can either go to the next step, or decide to store these discs in a consealed tupperware – it’ll keep for several days. 18. Pair up the Macarons. 19. Pipe the ganache centre mixture (Please read the ganache recipe below) or any other mixture of your choice & sandwich the Macarons together. 20. Place in a tupperware & store it in a refrigerator. 21. Best eaten the next day! 1. Have the chocolate ready in a mixing bowl. 3. 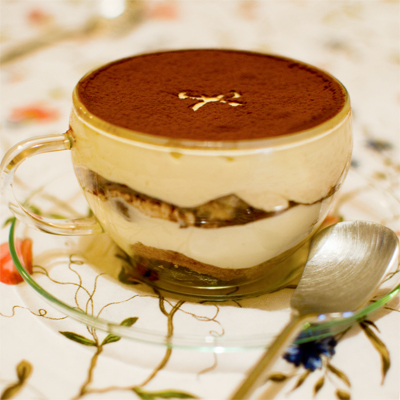 Pour the hot cream over the chocolate.4. Leave to stand for 10 seconds. 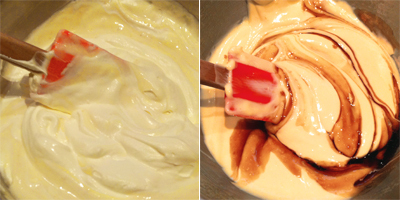 Then use your spatula to mix it in – SLOWLY – from the centre, incorporating more cream from the sides as you do it. Please follow the basic recipe above. 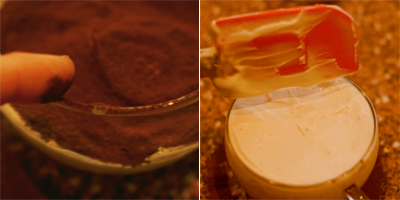 The red food colour will add that extra richness to the chocolate colour. To make green tea Macarons, you can user the same measurements as this – just swap cocoa to green tea powder, and omit the red colour. .x x x x x x x x x x x x x x x x x x x x x x x x x x x x x x x x x x. “AHHH. Donuts Macarons… What can’t they do.” – adaptation quote from Homer Simpson…! ps: Which is the correct way to spell – macaron or macaroon? The original french version is ‘macaron’. But the english version seems to be ‘macaroon’… Pronounced with the ‘oo’ too. But doesn’t that point toward the American Coconut Macaroons…, not the French kind? If anybody knows, please advise me! !